I’ve always been intrigued by people mentioning others “Character” in consideration of trusting them or at the very least judging their trustworthiness, in light of that person’s history of dealing with all sorts of things, not just the specific situation at hand. Depending on the view being held and the goal desired from the specific situation with which this person is being evaluated, a study of that person will develop, by what may be easiest to call curiosity, intrigue or seeking. This Series presents twenty-five (25) Attributes as a way to study His Character through Scripture that we can commit in our minds, follow through the Spirit and realize how to have those show through in our lives to others. We have Freedom in Him AND so much more. Each of the twenty-five (25) words allows us to discover how we can have and reflect the Attributes we are to have as Christians. Each of the prints can stand on their own, which can also be paired up in a smaller set of those things we may need or want to focus on in our lives. We may not realize that we are “practicing theological tendencies” in our daily lives as we seek to follow our Lord – but we do. In the following list are some of those “words” we use to identify them. When a person looks at you and I from a distance, what is it that they see? When others see our Character, would they preface it with “Christian” based upon what they witness us doing or the places they find us taking up? 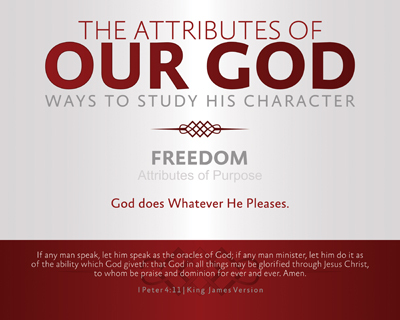 Of course, there are at least five of those words and ideas that we cannot directly emulate, but you may be surprised to find out that we actually can display them in the way we live… It has been my desire and practice to continue my learning process of God’s Character, discovering the attributes we can see and becoming more like Him with every step that I take. Does this sound like a challenge you’d like to take? Sure hope so, because we as Christians are supposed to be showing forth those attributes in our very lives. Learn one, apply it and then endeavor to show those around you Our God.